Dr. Sherman received his Bachelor of Science degree from the University of Wisconsin-Madison in 1999. After receiving his undergraduate degree, Dr. Sherman was accepted into the research fellowship program at the National Institute of Health in Bethesda, Maryland. After the fellowship program, Dr. Sherman was accepted into Tufts School of Dental Medicine in Boston, Massachusetts. Following dental school, Dr. Sherman was accepted into the postgraduate endodontic program at Nova Southeastern University. Dr. Sherman is currently in private practice in the field of endodontics in San Diego's North County. An abscessed tooth is a dental condition in which the nerve of the tooth, also referred to as the dental pulp, has become infected. The infection usually occurs when a dental cavity (tooth decay) goes untreated and spreads deep within the tooth. The infection can also occur from a broken or cracked tooth where the dental pulp is exposed to the oral environment. The bacteria that cause an abscess can spread down the length of the roots and into the surrounding bone tissue. Dental professionals also consider an infection can also occur between the gum tissues and the root of the tooth, which is called a periodontal abscess. Additionally, the dental nerve can be susceptible to injury leading to an infection after a crown or large filling are completed. The greater the amount of decay, the closer the dental treatment gets to the dental nerve, and the more likely the nerve can become compromised. Teeth that are directly subjected to dental trauma (for example, from a fall or from a hit by a projectile such as a baseball) are also prone to infection and should be immediately examined by a dentist. Picture of an abscessed tooth. constant throb associated with the tooth. odd or bitter taste in the mouth. Drainage from the gum tissue may also be present. The gum tissue can become inflamed, swollen, or infected. 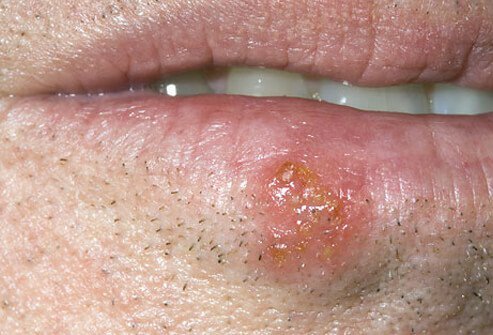 A small pimple on the gingival tissue referred to as a sinus tract may also develop and is usually representative of a dental infection. 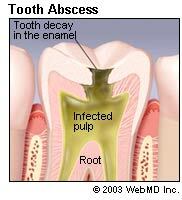 The abscess can be painful but occasionally the problem can go unnoticed unless detected by a dental professional. Diagnosis is usually achieved based on clinical symptoms or radiographic presentation. An X-ray can reveal bone loss along the ends of the dental roots indicating an infection or abscess. Clinical examination can also confirm the infection and may include pressure tests or simulation of the dental nerve with temperature (sensitivity to warm or cold foods or fluids). Once a tooth has an abscess, the treatment options consist of root canal therapy to clean and remove the infection or tooth extraction. Root canal therapy is a predictable and usually pain free procedure. If a wisdom tooth is involved, most commonly the tooth is removed. The prognosis for an abscessed tooth is good, especially if caught early. A dental professional may opt to place the patient on antibiotics at the time of treatment in order to prevent the infection from spreading further within the soft and hard tissue. Antibiotics are not always indicated and usually are prescribed at the discretion of the treating doctor. Warm compresses and pain management with anti-inflammatories are the best home remedies; however, the infection cannot be properly or fully addressed without seeing a dentist. Do not place aspirin directly over the gum tissue, this can lead to direct damage of the surrounding tissue. If the abscess goes untreated, the infection can progress to a cellulitis which can be serious and produce a life-threatening medical condition such as Ludwig's angina. Signs of a cellulitis or severe infection can include a fever, general malaise, and swollen lymph nodes in the neck or a draining sinus tract. If the abscess causes difficulty swallowing or problems breathing, immediate medical attention should be obtained. Bilateral swelling of the mandible, a condition known as Ludwig's angina, is a serious condition requiring hospitalization and IV antibiotics. The best way to prevent an abscessed tooth is to ensure regular examinations by a dentist to monitor and address any cavities present in the mouth. Some dentists recommend that radiographs should be taken at least twice a year to monitor the health of the maxillary and mandibular jaw bones. A toothache or tooth pain is most often caused when the nerve to a tooth is irritated, but there are numerous other reasons for a person to experience tooth pain. Risk factors for toothache include dental infection, gum disease, plaque, dental decay, injury, cracked teeth, poorly placed fillings or crowns, failing or leaking fillings or crowns, loss of a tooth (including tooth extractions), temporomandibular joint (TMJ) disorders, and obstructive sleep apnea. Gould, Jane M., et al. "Dental Abscess." Medscape. 30 May 2012. What symptoms and signs did you experience with your abscessed tooth? What treatment did you undergo for your abscessed tooth?